The mother lode imagined by sign companies and property owners who sought to turn hundreds of Los Angeles buildings into giant advertisements for movies, TV shows, cars, fast food and other products and services has proven to consist almost entirely of fool’s gold. For that we can thank the 9th Circuit Court of Appeals, which on Friday issued another in a series of rulings upholding the city’s outdoor advertising regulations. This decision by a three-judge panel involved the last of the active “copycat” lawsuits filed in the wake of the notorious World Wide Rush decision in 2008, in which a federal district judge declared L.A.’s ban on off-site and supergraphic signs unconstitutional. The 9th Circuit overturned the World Wide Rush ruling last year, and almost all of the more than 20 “copycat” lawsuits were subsequently dismissed. However, a Hollywood company called Vanguard Outdoor sought to file a new challenge, and asked for a preliminary injunction to stop the city from enforcing the supergraphic sign ban at three locations. Last September, U.S. District Judge Audrey Collins refused to grant the injunction, saying that all the constitutional claims involved were settled by 9th Circuit’s World Wide Rush decision issued last May. The company then appealed Judge Collins’ decision, although it removed its signs from the three locations in Hollywood, West L.A., and the mid-Wilshire area. According to a filing last week in Judge Collins’ court, the city and the company are engaging in settlement discussions, which presumably involve the payment of a penalty by the company, which the city sued last year in L.A. County Superior Court. That lawsuit, one of several filed by City Attorney Carmen Trutanich against sign scofflaws and property owners, alleged that the multi-story supergraphic signs either attached to a building with bolts and cables or applied with an adhesive violated numerous provisions of both city and state law. That lawsuit, like the others, seeks penalties of up to $2,500 a day for the time the signs were displayed, and disgorgement of revenue gained from the signage. 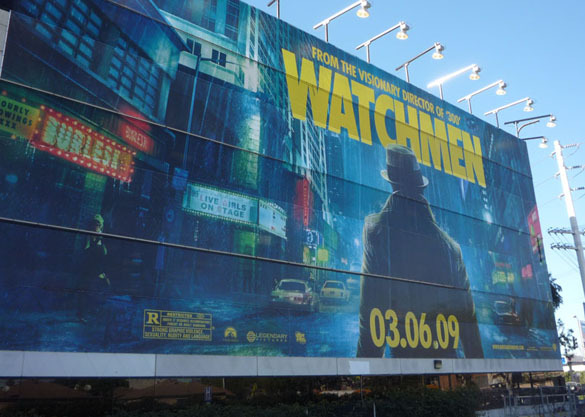 One such lawsuit, against CBS Outdoor, was recently settled when the company agreed to pay the city a $4.5 million fine for displaying unpermitted supergraphic signs on buildings in Hollywood and downtown. All this activity doesn’t mean that every supergraphic sign in the city will disappear. Some were grandfathered by the sign ban adopted in 2002, and others have been legally permitted as part of sign districts and development agreements. A new sign ordinance passed by the City Planning Commission two years ago removed the development agreement exception and greatly restricted sign districts, but that ordinance has languished in a City Council committee ever since. Which means that while the proliferation of illegal signs has been stopped, at least for the time being, legal supergraphic and off-site signs thus far restricted to downtown and Hollywood could spread into other areas of the city. Sign Districts have been proposed for such areas as Koreatown, the Cahuenga Pass area, the city’s westside, and parts of the San Fernando Valley. And there’s no guarantee that some rogue company and unprincipled property owner won’t give into the lure of revenue from the multi-story signs, which can approach $100,000 a month in high-traffic locations. What’s almost certain, though, is that suing the city on claims that the supergraphic sign ban violates the constitution will be a waste of time and money.